There is some confusion among residential builders concerning the role of steel reinforcement in concrete slabs. Over the past few years, there has been a considerable amount of advertising from various sources alluding to the placing of concrete without steel reinforcement. The purpose of steel reinforcement is not to prevent cracks forming in the slab- all slabs will crack. Properly located steel reinforcement holds these cracks tightly together, and stops them getting wider, so that the slab can continue to look good and do its job. Some advertising has stated that steel reinforcement can be left out and compensated for with admixtures and enhancers of various types. Unfortunately for many builders and owners who left out steel reinforcement, slabs have cracked and opened up widely, leaving the home-owner to face a huge repair bill. When you are building your home there is always the temptation to save a few dollars where you can, and saving it on something that is not finally going to be seen, such as steel reinforcement buried in concrete, may seem an irresistible attraction. But putting yourself at considerable financial risk in order to save a small amount of money may not be wise. For the vital role that reinforcement plays in concrete, the cost is low - about $1,500 for an average slab. Repairs and replacement of poorly constructed concrete work will result in costs many times greater. Further, Contractor / owner conflicts are frequently reported and many end up in expensive litigation which soon makes building costs pale into insignificance. Benefits of steel reinforcement for concrete slabs. Steel reinforcement controls crack widths and helps maintain aggregate interlock. Steel reinforcement can keep a slab in a serviceable condition. 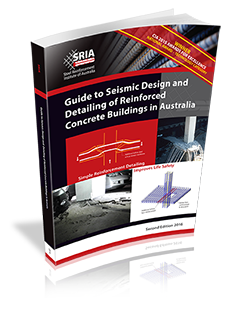 Displacement and slab curl is minimised when steel reinforcement is provided. Despite suggestions that various admixtures can increase the strength of concrete, and therefore slab thickness can be reduced and panels made larger, you should always seek the advice of a Chartered Professional Engineer before departing from proven steel reinforced concrete designs. inadequate chairing of the steel. If the steel is not in the right place, it might as well not be there! adding water to the mix. The mix can start to set on a hot day before you have poured, but adding just 10% extra water can lose you half the strength of your concrete. Mesh is easy to handle! Because reinforcing fabric is already welded at the correct spacings, the time consuming task of placing and tying individual reinforcing bars is unnecessary. A minimum number of ties and supports will locate the fabric firmly in the correct position. Welded wire fabric is available in a wide range of types, with different wire sizes and spacings to suit your needs. Steel reinforcement can be rapidly supplied to any project across Australia by SRIA member companies, together with a full range of accessories. A simple call or visit to your local member company service centre will answer any of your problems. Mesh is economical to use! Real savings in cost and time can be made by using specific reinforcing steel products. Fabric sheets can be pre-cut to shape and size. Footing cages and column or beam cages can be supplied pre-assembled and ready for instant placement, and reduce the need to tie loose bars.